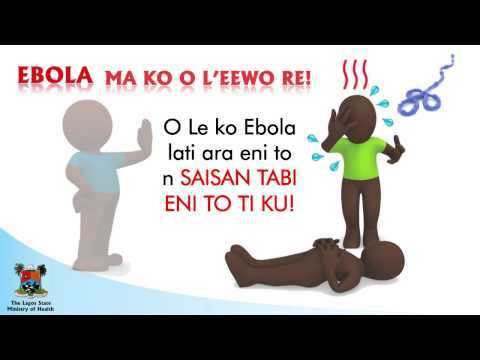 In a previous post, I included a link to a YouTube video on ebola in the Yoruba language. For reference, other videos on the subject in Yoruba and other Nigerian languages are accessible via @LensOnEbola on Twitter. In this post, however, I'd like to highlight some information in written Standard Yoruba, since that can be read, revised, remixed, and reused in various ways. First, a quick intro to written Yoruba. The Latin-based script currently used for Yoruba in Nigeria - most of the Yorubaphone population lives in the southwestern part of that country - was developed beginning in the early 19th century (Samuel Ajayi Crowther, a remarkable figure in Nigerian history, was associated with that process). This orthography normally uses some characters with either small vertical lines or dots under (the latter sometimes referred to in English as "subdots") to represent the "open e" and "open o" vowel sounds and the "sh" sound (ẹ, ọ, ṣ). Since it is a tonal language, tone marks help disambiguate meaning, though are sometimes omitted. The Yoruba alphabet is considered a "complex Latin" script (Vietnamese is also in this category). Yoruba varieties in Benin are written with characters from the African reference alphabet. (Latin-based orthographies for African languages are generally fixed on the national level, and in many other cases have common characters and rules across borders). The Alákọ̀wé blog has a post entitled simply "Ebola" (18 Aug. 2014; this blog is a nice presentation of Yoruba text, although the chosen font fails on some "subdot" letters; also audio). "Arun Ebola: E gbe igbese kia, e yee seleri asan faw on araalu — PDP"
"Ara eni ti arun Ebola ba da dubule nikan leeyan ti le ko o — Dokita Jide Idris"
The Yoruba edition of Wikipedia (one of the largest editions in African languages) has a translated article about ebola entitled "Àrùn kòkòrò àìlèfojúrí afàìsàn Ebola." This is likely a result of the WikiProjectMed efforts. A graphic, apparently from the Lagos State Ministry of Health with text that may be Yoruba. This is just a sampling for one specific major language of West Africa. Any more complete and useful list of material on ebola in Yoruba would require a more systematic effort, as well as of course people literate in the language Such collection of material in languages of the region could be used to develop information banks on ebola (and eventually other health issues) in those languages, which could be tapped for a range of public information, health worker training, and general education uses.